This is the second of this series, and the fourth or fifth title by this author that I have reviewed, and I will make a simple recommendation as I start. If you want a story that is light, entertaining and doesn’t consume your time or attention: this is the series for you. Set around the furor of the London Season, each story manages to provide a simple romance with characters that are easy to picture, with a feel of a simpler time in the storyline: much like watching an old black and white sitcom. This particular story has Emily at the center; she has rented the house for the season with only her uncle to serve as chaperone. Quickly the story reveals a Cinderella style plot, and only the servants suspected all did not ring true in her story. In this series, the below-stairs characters are often more prominent, and in this story their determination to help Emily in her romantic wishes to catch the Earl’s eye. The servants of the house at No. 67 are cleverly portrayed and fully determined to help Emily find her love, and there are moments that are laugh out loud funny. 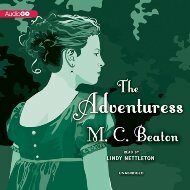 With a clever use of the characters that one never sees as more than background in Regency novels, M.C. Beaton has penned a clever, fun and enjoyable story, perfect for an afternoons entertainment. Narration provided by Lindy Nettleton is simply a perfect addition to the story, being neither too affected with acting, nor distracting with speech patterns and tone shifts. She provides a lovely listen as she narrates this novella, and it is a good way to spend a quiet and enjoyable afternoon. With Each London Season, an enchanting Romance Moves into the Fashionable Townhouse at Number 67 Clarges Street. And There Below Stairs the Staff Has a Special Mission--to Arrange a Match...to Hatch a Scheme ... to Bring Love Home to A House for the Season. Beauty is a powerful magnet, and every man in the ton is drawn to the exquisite loveliness of Miss Emily Goodenough, who has rented the Clarges Street house with her rather peculiar old uncle. Only Rainbird, the butler, suspects that Miss Goodenough's origins might be less than genteel--in fact, that the beauteous Emily may be a runaway chambermaid and her "uncle" a fellow butler! But Emily has fallen desperately in love with the handsome, haughty Earl of Fleetwood, and since the bogus upstairs couple quickly wins the downstairs' servants' hearts... Rainbird and his friends are determined to make a lowly maid the catch of the Season for high society's most desirable Lord!